The project is called Adopt-a-Turkey, and it was started in 1986 by Farm Sanctuary. I first learned about this organization during an episode of Ellen, because DeGeneres has been a big supporter of the nonprofit, which seeks to save farm animals from some pretty miserable (and oftentimes inhumane) conditions. Since they started the Adopt-a-Turkey Project 25 years ago, they have saved thousands of turkeys from things like debeaking, detoeing and an overcrowded pen that leaves them 3 square feet of space in live in (that's just the bare bones of it, you can read more about the plight of the turkey here). Once these birds are plucked (pun intended) from such conditions, they are then placed into sanctuaries throughout the U.S. until they're found a permanent, loving home. I know what you're thinking...turkeys as pets?? But ask anyone who raises chickens (I'm talking independent people, not companies), and they'll tell you that these birds become great companions, and turkeys follow suit. 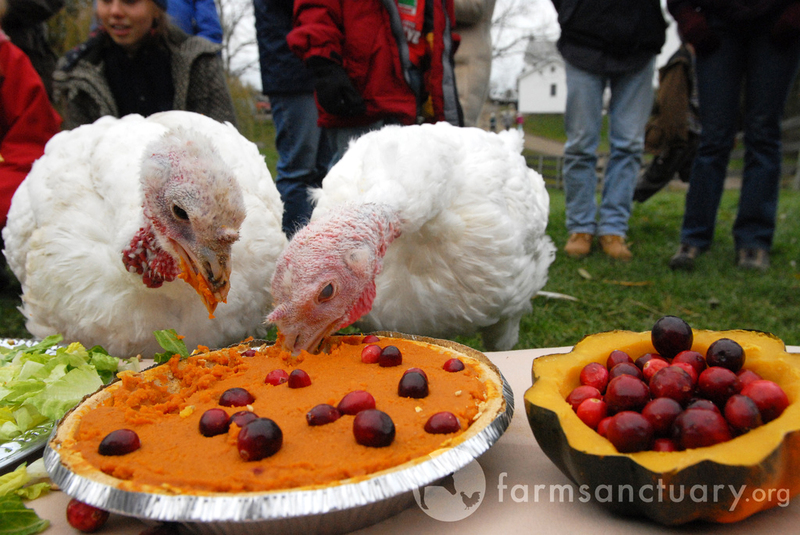 So if you're interested in taking one in, check in with Farm Sanctuary and see when the next Turkey Express adoption event is. As for the rest of us, there is a list of some pretty cute turkeys you can sponsor at the sanctuary, where the money will go to support their feeding and care while they're there. turkeys are wonderful pets, we love them--but we also harvest them--we feel it's a trade off, they have a good life here on our farm and then we eat them--they free range, hang out with us and then before it gets cold and miserable we harvest them--it's life, I know I'm probably offending folks, sorry! !